In the spirit of California Wine Month we’re dishing out the ultimate guide for planning the perfect Backyard BBQ or Wine and Dine Party! The Summer to Fall transition is a great time to host a barbecue or wine soiree for all of your closest friends as the weather starts to cool down and the holiday frenzy is still a ways off. 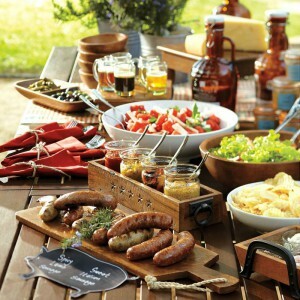 The best Backyard Barbecues or Wine Parties however take careful planning. So what is it you’ll need to throw an impeccable get-together? We list some steps to make this autumn celebration one your friends will be raving about for months to come! 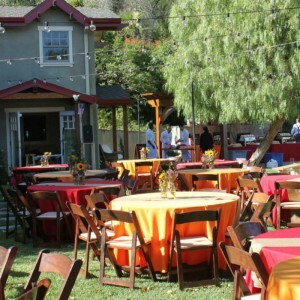 Asking yourself what to get the host or hostess of a Fall party you just got invited to? Find excellent gift ideas based on the type of party below! 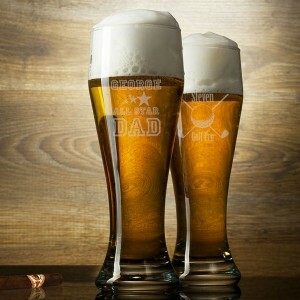 The perfect way to cool down with your favorite beer at a party is with an awesome mug that says it’s all yours! Our Engraved Glass Beer Mugs can be completed with a personalized, sand etched engraving of the recipient’s first name or initials – making it an excellent host gift they won’t even think of re-gifting! No Backyard BBQ or Wine and Dine Party is complete without the right stemware. Not only a delight for the guests, but these Monogrammed Wine Glasses will make for a unique and cherished gift for the host or hostess! These fun glasses will also be sure to set off some Instagram-worthy moments. Two weeks before the party, make a list of all your guests and send out the invitations! Based on the number of guests you’ll have, make a list of all the ingredients and non-food supplies you’ll need. If you’re planning on renting or buying outdoor equipment like tables or chairs, make those arrangements now. Would you like some cheese with that wine? Your guests won’t be able to get enough of it when they see this chic Monogrammed Bamboo Cheese Board Set. 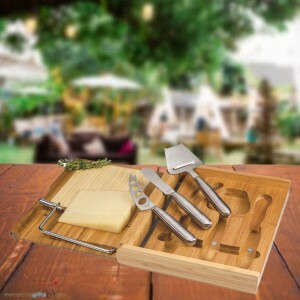 Complete with quality stainless steel tools and a wide aluminum and wood cutting & serving board, it also makes the perfect gift for the cheese lover in your life. 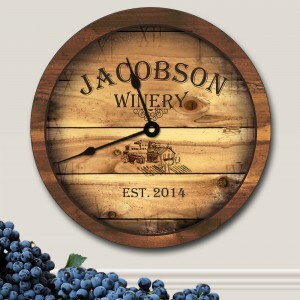 The wine lover in your life will be inviting you over for #WineWednesday more often after receiving this Rustic Personalized Family Winery Wall Clock! With its wooden design and wine accents this clock truly is an amazing host or hostess gift to give or receive, and adds a great touch to your wine get-together. If possible, set up your tables, chairs & decorations a few days before the party. Make sure the seating is in a shady, comfortable area. Also place a couple of big garbage bins in easy access spots. Start preparing any foods & desserts that can be stored ahead of time and check in with your guests if you asked them to bring anything. Hosting a couple’s Wine and Dine shindig? Let everyone know you mean business! 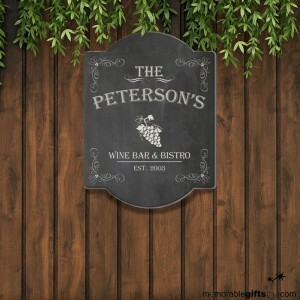 This Customized Wine Bar and Bistro Sign will step up the ambiance for the evening ahead at either a backyard party or an indoor wine tasting. 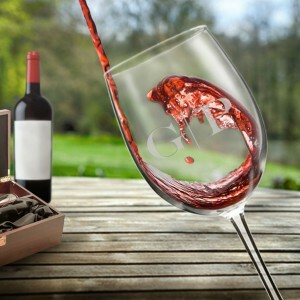 It also makes an unforgettable housewarming gift for the wine enthusiast in your life. 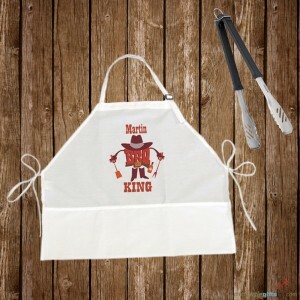 Let everyone know who’s king of the barbecue with this self-proclaimed Custom BBQ King Apron! This white polyester bib style apron measures 28″ x 24″ and has 3 Pockets, making it the perfect accessory for any grill master and a host gift they’ll be sure to put on right away and with pride! 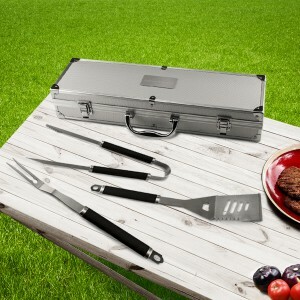 And no grill master should be without this Stainless Steel BBQ Tool Set! It includes oversized tongs, a fork and slotted spatula with a built in bottle opener that will make grilling the most fun he’ll have all year. Having two lines of text laser engraved on the engraving plate will make this the type of gift we wants to carry around and show off. Make the final adjustments to your décor and set up the food items and utensils buffet-style for easy access. Keep food covered and drinks in a cooler stocked with ice (replenished throughout the day) to maintain freshness. 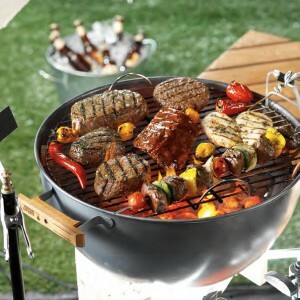 Now you can show off your barbecuing skills or new drink recipes and most importantly – have fun!